Many of my fellow journalists, in meeting up with the Coen brothers, Joel and Ethan, come away disappointed, or even disillusioned. Considering their smart, subversive, playful films like their Raising Arizona, Fargo or The Big Lebowski, we anticipate two happily verbal guys bubbling with fascinating things to say about their movies. But their Brother Where Art Thou? press conference at Cannes in 2000 was a typical Coens' showing: the duo smug and diffident, strangely disconnected from the Q&A. Their short-cut, frustratingly evasive answers made them appear tired of discussing their movie - although it was the world premiere! Ethan: "You make the movie and journalists have to write about something... There it is. I don't know." Joel: "What I think you are referring to is to the fact that we often resist the efforts of... people who are interviewing us to enlist us in that process ourselves. And we resist it not because we object to it but simply because it isn't something that particularily interests us." So I was braced - braced to get nothing! - at Cannes 2001, when a gathering of American journalists interviewed the leads and, again, the Coen brothers about The Man Who Wasn't There, their Billy Bob Thornton-starring homage to the hardboiled "noir" view of novelist James M. Cain. First we got Thornton, an off-the-screen little guy in a Metallica t-shirt and anxious to talk... about how he adores his wife, Angelina Jolie. He leaned over the table to show the gathered fourth estate the vial of spouse-blood which hangs about his neck. "For our anniversary, she gave me her will," he said, proudly. "She got us both burial spots in Arkansas next to my brother, who died in 1988." What about Thornton's character in this movie, small-town barber, Ed Crane? "It's this guy and the guy in A Simple Plan who are closest to myself. I feel like 'the man who wasn't there.' I got my wife, my kids, my mom. I'm not interested in things outside the basement and the back yard. I always identify with John Lennon, who loved to stay home. "I love all the Bogart movies, and Fred MacMurray in Double Indemnity. I think MacMurray is a great actor. For this movie, I didn't try to look like Bogart. I was thinking more about Frank Sinatra. When you get into that mood, you look like those guys. In real life, we're not in black-and-white, but somehow that feels more real in this movie, more monochromatic. You can feel people sweating in black-and-white." Next up was Frances McDormand, wife of director Joel Coen, Oscar winner as the cornflakes Minnesota cop, Marge, in Fargo, and acclaimed as the protective mom in Almost Famous. "Marge was the embodiment of all things an actress is supposed to be," McDormand said, nostalgic for that once-in-a-lifetime part, "and in Almost Famous, I felt voluptuous and free, very alive and jiggly and complex." In marked contrast, she said of her femme fatale, Doris, in The Man Who Wasn't There, that "the role was more technical than usual, me caring that my lipstick was right, the hair was perfect. The challenge was mostly the black-and-white. The movie is about Ed Crane, not Doris." What about the Coen Brothers' communicativeness? McDormand, who is straight and open, shook her head, bemused. She knows, because the vacuum that journalists feel is also present on the set. Even for McDormand, being directed by her husband, Joel. "Sometimes it's easier getting direction from Ethan," she confided. "He's more direct. Since Blood Simple, it's a huge improvement how they have dialogue with actors. Their not communicating was to the peril of certain performances." Are they really opening up? 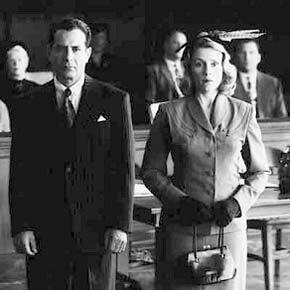 McDormand told us that The Man Who Wasn't There is a more personal project than earlier Coen brothers films. A journalist nudged them. "Frances says this film is more personal. How is it personal?" Ethan: "I don't think it's more personal or less personal. There's nothing autobiographical." Joel: "It's set in the 1940s, and that's not personal. These are stories which take us away from first-hand experience." The Coens at Cannes spill all! You've read it here first.